I would have never believed way back in 2007 that an experimental WordPress install on a sub-domain of my design portfolio would become my entire livelihood. 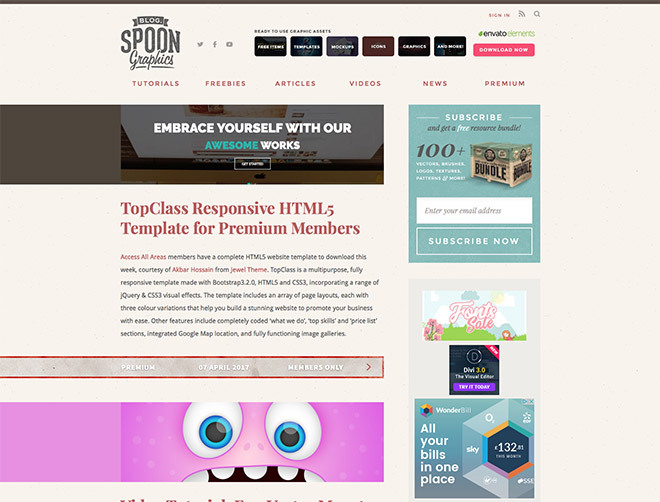 It’s now 10 years since the Spoon Graphics Blog was launched, and both the website and my life have changed dramatically over the last decade. 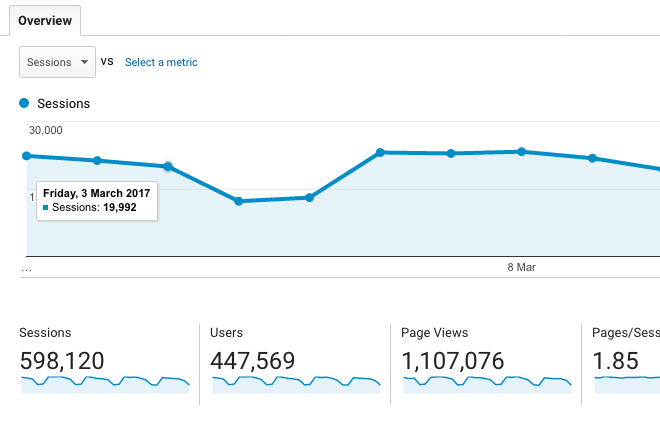 Every April I share some behind the scenes insights, which document my site’s growth and the opportunities that came from it. 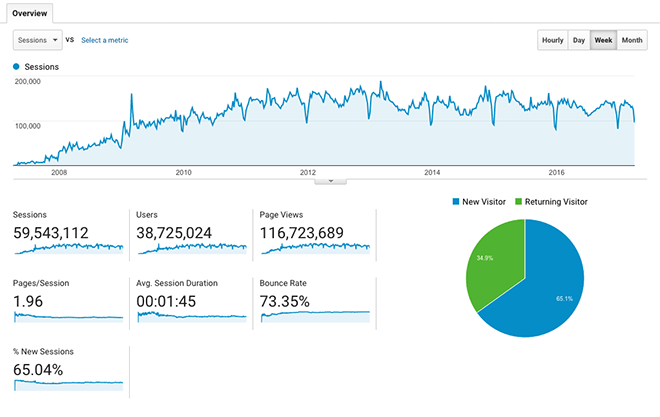 Last year I talked about how my website redesign resulted in a huge growth in newsletter subscribers, so let’s take a look at the latest stats and figures. These ten years have definitely gone fast! I often come up with tutorial ideas but think to myself “I’m sure I covered that subject just a few months ago”, only to find that it’s actually years since the post went out. The main challenge I face these days is thinking up new post ideas each week. I just hope I can find enough inspiration to last another decade! One important lesson I’ve learned is to continuously evolve my site to keep up with technological trends and changes. When I started this blog, ad revenue was my primary source of income, but that has drastically reduced over recent years. I’m just glad I planted some additional seeds in the form of my Access All Areas membership, the email newsletter and my Spoon Graphics YouTube channel, which have developed sources of income to replace what has been lost in ad sales. I want to take this opportunity to express my huge gratitude to all my readers. Without a loyal audience it just wouldn’t be feasible to keep this site going, so I appreciate everyone who enjoys my content, becomes a premium member and purchases a deal I recommend. An exceptionally big shout out goes to all you veterans who have been around since the early days! Traffic is still on the decline overall, down 5% from last year. I assume this is down to periodic changes in the Google algorithms that cause older posts that used to receive a lot of attention to drop off the search results, as well as general changes in people’s social media habits. Traffic referred from StumbleUpon, Facebook and Twitter is nothing compared to the serious traffic spikes they caused in 2012, although one exception is Pinterest, which is showing a gradual increase in referrals. There’s been no change when it comes to my top content. Those two cited posts have been at the top of the chart for many years, although it’s strange that they have switched places this year! My highest traffic peak remains unchallenged from November 11th 2014. Traffic spikes are pretty much non-existent these days, with the best attempt in 2016-2017 being a slightly higher than average 25,953. 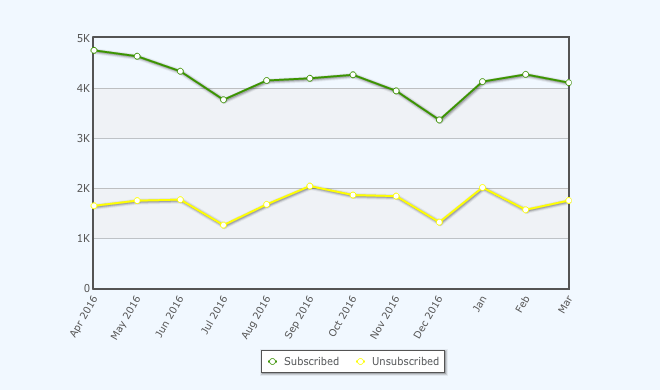 It’s great to see my mailing list still growing, even though the daily subscribers figure has declined slightly, from 200 to around 130 per day. 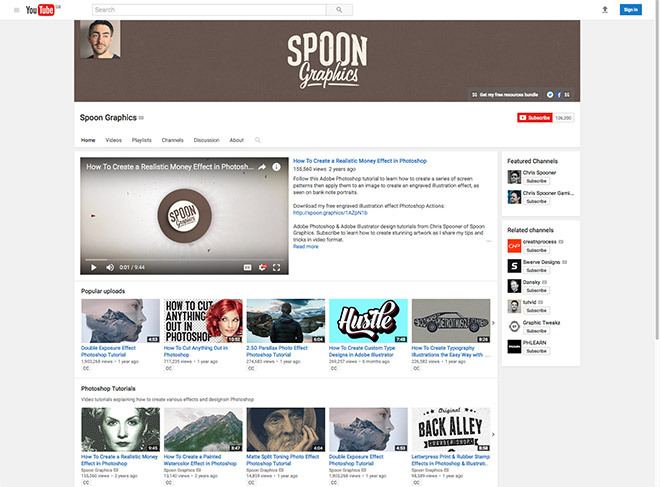 My Spoon Graphics YouTube Channel has been exploding this past year, with subscriber stats passing the 100k milestone in January. Comparing daily YouTube views with daily website visitors, my channel traffic isn’t far behind at around 17,000 views per day. My server setup has been reliable since it was upgraded in 2014, just the monthly bandwidth use has increased, spiking a couple of times to 10TB per month. One change that is currently in the works is the addition of an SSL certificate to switch over to https. The latest browser versions these days display warnings on insecure password fields, so the SSL will sort that out whilst also giving me the ability to expand the payment gateway options for my Access All Areas memberships in the future. Since this year marks a big milestone, I thought it would be interesting to dig out some mind blowing statistics from the lifetime of Spoon Graphics. Congrats on the 10th anniversary, Chris. Easily one of the best graphic design sites on the web. I teach college design classes and always point my students at your blog. Keep up the great work! It’s great to look at the stats and see how the channel/blog have grown! Thanks Jacob! congratulations for 10th anniversary, i know this is great feeling to see that your blog is growing and it has now become 10 years old. i have few blogs which are only 1-2 years old only and i have long way to go now. Congratulations Chris, I enjoy your blog and post, a great inspiration. Here is to another decade of inspiration. Congrats on the 10th anniversary, Chris. Hi Chris, just follow you since many year. Congratulations for your 10 years of activity! Congrats, Chris! What you’ve achieved here is incredible. Wishing you all the best over the next 10 years! Thank you Sam, I really appreciate your comment! Congratulations! Thank you for providing so much great content..you have been a great inspiration and confidence builder for me to finally launch my site suzanneoutstanding.com next month. Thank you very much Suzanne, that’s great with your launch! Best of luck and success! You’re the bomb. Always look forward to your posts. I have learned so much from you, and appreciate your talent immensely. Congratulations, Chris! Appreciate your comment Angela! Thank you! Congratulations Chris on the 10th anniversary! Happy Ten years! What a accomplishment! Wow! It was around 10-13 years ago that I got interested in Photoshop. So, I suppose, you have been there from the get-go, for me! You are a staple in the design scene! It has been kinda fun seeing your growth through the years. My wish is to you for many more years, with much more success and, of course, much more happiness! Blessings, Chris! Happy birthday to the blog, Chris. Congratulations for keep making it great! Spoongraphics I congratulate you on your accomplishments. I have looked forward to all your posts. Probably because you have an atlook which is to help your fellow man to better himself/herself! Thank you for your kind words Norman! Congratulations! You are doing a wonderful job! Congrats…your work is awesome! I watch EVERY tutorial you post. And if you want to repeat a subject, that’s fine with me. There are always new hidden gems lurking within the Adobe updates. Thanks a bunch for your generous and inspiring work until now, now, and in the future! You were one of the first to follow for me, and I’m impressed by your work, your structure and your strategies! Thank you for your lovely comment Susanne! Well done. Very well done. Thank you for all that you do. been watching your tutorial since 2011, thank you for sharing your passion with us! keep it up! Keep up the good work. As a design student, I have been absolutely loving your blog and video tutorials. Congratulations, Chris! Your creative enthusiasm is infectious and appreciated! Thanks for your lovely comment Tom! Years are passing like hours, we are here for extra 10 years dude, keep it up. Thanks! Its quite scary how time flies! Congrats on 10 years Chris. Love that purple monster in your screenshot. Is that a tutorial? I’ve been searching and haven’t found it yet. Congratulations, Chris! You were the beginning of something beautiful, helpful and creative! I hope the next beautiful! 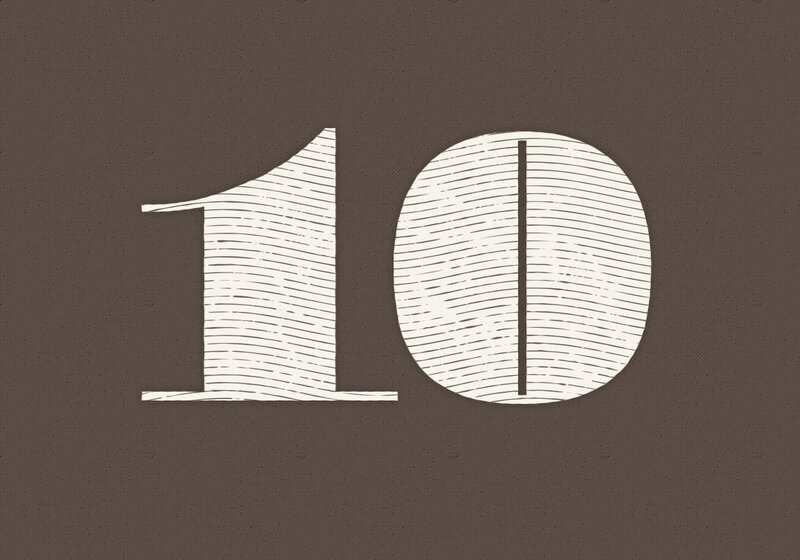 Compliments to you Chris for your amazing 10 years blogging anniversary. As an enthusiastic learner, I can say your buckshee tutorial always provide awesome value for learning new graphics design work. I thank you for your incredible success. Congrats for the 10th anniversary! Congratulations on this milestone Chris. So many blogs don’t get anywhere near a decade old and yours has been such a consistent and reliable resource of information for so many during this time. Well done and keep it up! Congratulations Chris. You’re an inspiration. Many happy returns. Congrats Chris, Been following your tutorials for a while now.. Thanks, you have taught me alot..
Wow what a milestone! Congratulations and thank you for all the great ideas over the years and fantastic offers! Wow, congratulations Chris. Your blog has always been a really valuable resource to me. Keep up the amazing work. Thank you Mike, glad to hear the resources have been useful!